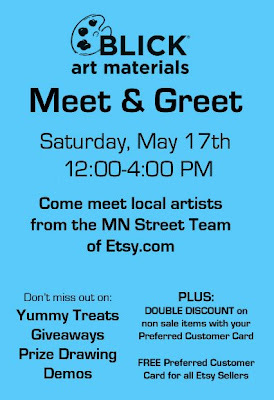 Come see and talk with some local TeamMN members Saturday, May 17th at Blick Art Materials in Minnetonka! See our flyer below for more details. 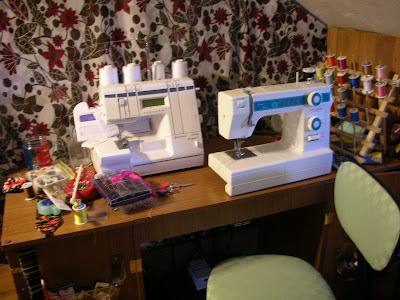 My workspace consists of four areas: sewing table, ironing table, craft table, and “storage” (used very, very loosely). My favorite feature is the ironing table, since I can spread out and iron big or weirdly shaped objects without trying to fit it onto a narrow board. Close second would be the checkered linoleum I used to cover the craft table! I wouldn’t be able to work without my machines and my iron. I don’t use my serger nearly enough, but when I do, I remember how it’s just about the most awesome thing ever invented. I have a fancy pants iron (Black and Decker Digital Advantage) which I find pretty indispensable. I never iron my clothes, but I iron every project at least once. I need light, color, and storage. I work partially in a weird alcove that doesn’t get much natural light, and gets even less of the overhead light. 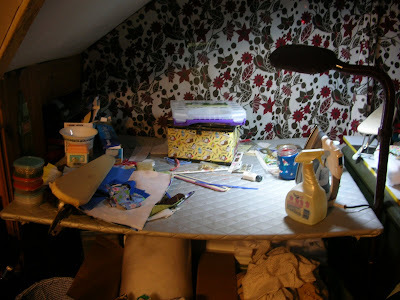 I have a great “daylight” lamp that shifts between my ironing table and craft table, but it’s just not the same. I recently added the curtains around my workspace to give a little more color, but it’s still a very white workspace. If someone could just come in, reorganize, and tell me exactly where to put everything, I would be in heaven. 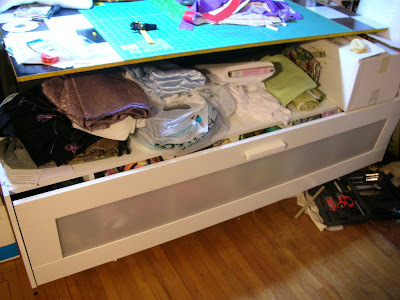 I lack the organizing gene, and pretty much just throw things in boxes, on tabletops, or on the floor. I lack the ability to dream up a creative space. I could look in a magazine and say, “That would be nice to have,” but really nothing specific comes to mind. I think my brain lives too much in the present and what is directly in front of me, so I have never bothered to come up with something. In this way, I have also never come up with a dream job, a dream home, or a dream wedding. Que será! 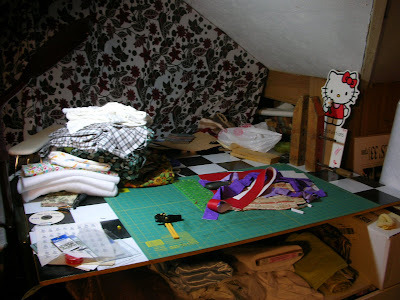 ~Rethink the ordinary: With one piece of particle board, I was able to make two workspaces. I created a table top for an old desk and came up with a craft table (it’s about two feet wider than the desk). With the extra, I solved my problem of an ironing board just not being big enough by covering it with prequilted ironing board fabric from Jo-Ann and adding some legs from Menards. ~Reupholster at least once: Seriously, it’s easier than it looks, and the results make a huge difference. 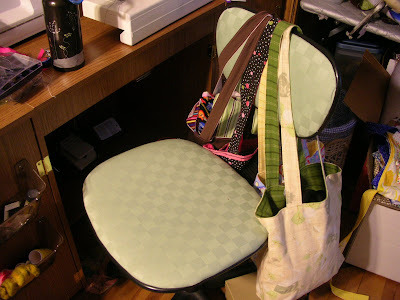 Even a cheap office chair from Target can become something funky and special with a little prying and some staples. At the moment I don’t really have the wallspace for inspiration. I have a couple bottles from Karen of Unblinking Eye, but that’s about all the decoration I have room for. I have a good number of books, though, that I like to use for reference. My favorites are Debbie Mumm’s New Expressions and Better Homes and Gardens’ Sewing Book from 1970. It usually goes a little something like this: Cut out fabric, get distracted, iron fabric, get distracted, sew, get distracted, iron again… repeating until the object is finished. I usually work in batches, though, so I cut out pieces for many projects all at once, sew everything that needs the same color thread, etc. I usually try to have a kitchen timer going to minimize distraction. I make myself do as much work as possible in an hour before I get a break. This also helps me gauge how long it takes to make my items, and helps me price. 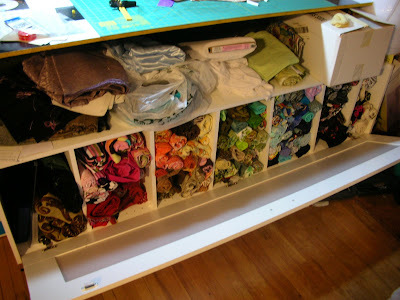 Maybe someday I will pare down my crafts to limit the amount of stuff I have. Maybe. Really, though, what fun would life be if I couldn’t work on knitting, sewing, needlepoint, soap and candle making, soldering, and papercrafting at a moment’s notice? Now spotting TeamMN members has now been made easier. Some of our fellow TeamMN members will now be sporting a nifty TeamMN button. Now you can easily spot them at shows or just walking around town. Here are a couple of fellow TeamMN member that traded for a TeamMN button! A Tempting Morsel traded these yummy cookies for a button! Check out her shop for all her wonderful delicious treats! SD Designs also traded for a button. She traded these gorgeous circle earrings. Check out her shop for great high quality sterling silver finds! Here's a list of all the other wonderful seller that have TeamMN buttons. If you live in Minnesota, have an Etsy shop and would like to join TeamMN, please contact Jenna through her shop ArtisticEdition for more info. 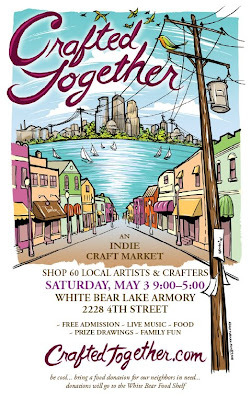 On Saturday, May 3rd, fellow TeamMN members will be selling at Crafted Together in White Bear Lake. Click the poster for more info. The sale will be held at the Armory in Downtown White Bear Lake from 9am-5pm. 2228 4th Street, White Bear Lake, MN. 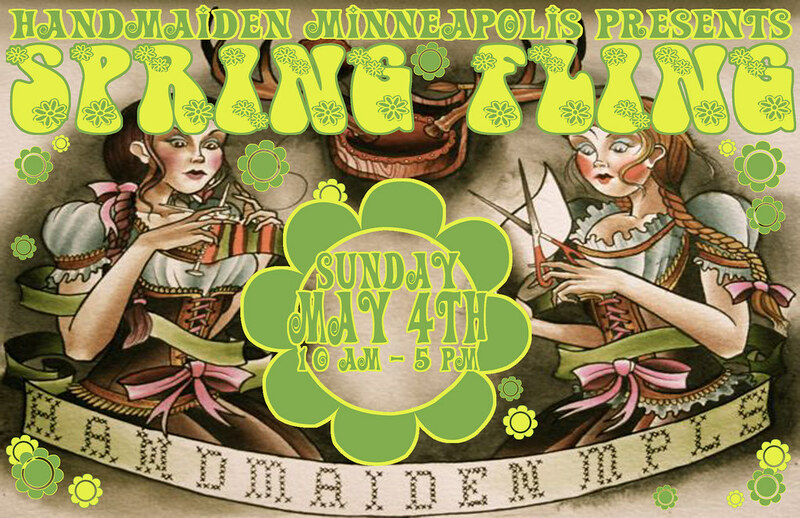 On Sunday, May 4th, fellow TeamMN members will be selling at The Handmaidens’ Minneapolis Spring Fling Show. There are vendors located upstairs and downstairs, so be sure to check out both levels. Click the post card for more info. The sale will be held at the Ballentine VFW from 10am-5pm. 2916 Lyndale Ave. So, Minneapolis, MN.